Being an eminent organization in the industry, we are involved in manufacturing a premium quality range of Water Sticker. Alkaline Water Stick contains tourmaline ceramics, water soluble calcium carbonate, coral fossil, dechlorine ceramics and black stone. Alkaline Water Stick contains natural ores and these ingredients are dissolved out into water. These ores decompose and remove chlorine and other unpleasant odors as well as alkalinize water. 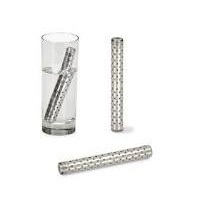 We are at the apex of listed Alkaline Hydrogen Water Stick Suppliers and Exporters from Bikaner, Rajasthan. An enormous range of Alkaline Hydrogen Water Stick provided by us is mostly used to transform bottled or tap water into ionized water on the go! With ability of offering 9-9.5 and ORP is -100 to -150, the Alkaline Hydrogen Water Stick is known as the best option to have ionized water.